After four years at the helm, and earlier time spent in envisaging and establishing the organisation, ACID�s founding Chief Executive Officer Jeff Jones has left us to pursue new directions and opportunities in interaction design and user experiences. Jeff has played a pivotal role at ACID from the earliest days of scribbling ideas on the back of a napkin, through the major task of securing partner organisations and developing the successful bid to establish the ACID as a CRC, to building Australia�s capability in research and commercialisation in interaction design. At a meeting with ACID team members on 8 June, his last day in the office, Jeff said he remains committed to ACID�s success, but that this part of his work is now complete. ACID Chair Terry Cutler said that Jeff is part of ACID�s DNA, and vice versa. Jeff intends to remain a QUT Adjunct Professor and will continue working in interaction design and user experiences. In the short term, he will take up the Australian Government�s prestigious Endeavour Executive Award to visit R&D organisations in China and build links between Australia and China. At the meeting of the ACID team on 8 June, ACID Chairman Terry Cutler said ACID faces three big opportunities right now: progressing the commercialisation prospects on several projects, strengthening our research program, and preparing the bid for a �new-from-existing� CRC to continue ACID�s work after 2010. �The ACID Board is absolutely committed to growing ACID�s footprint and exploiting the research and commercialisation prospects that already exist,� he said. Terry said that finding a new Director of Research will be a priority now that Jeff Jones has left, but that ACID�s collective knowledge is the basis of a sound future. Terry said the Board, the Research Leaders Group, Program Managers, and senior management have already started to consolidate a forward Business plan for ACID�s core research programmes and to shape a solid research-to-commercialisation pipeline for the final three years of ACID�s current funding. Work has also started on ACID�s bid for new CRC funding to pick up in 2010 when current funding is due to end. �Preparing the new bid will be a big job involving many people on the ACID team, and it will be exciting: it�s a chance to think seriously about the future of our industry and to shape a new CRC that can take ACID�s expertise further and get out in front with research leadership around emerging industry trends," Terry said. "We're doing great work and we're the only CRC in our field, so it�s important that we all promote the importance of this sector for Australia. Design for effective interaction is at the heart of the whole Web 2.0 and social networking phenomenon�. Two years ago, ACID�s Scientific Advisory Group suggested ACID should run an international conference. As a result, we set about securing the right to host VSMM07, the 2007 conference of the Virtual Systems and Multimedia Society. ACID organising committee member James Hills said VSMM07 has now secured the patronage and endorsement of UNESCO through its Culture Sector. �UNESCO is endorsing VSMM07 in recognition of the common goal of the VSMM Society and UNESCO�s World Heritage Centre to foster the development of ICT in heritage protection,� James said. James said other major themes to be explored at VSMM07 include Virtual Environments and Virtual Experiences, and Applied Technologies and Systems. James encourages all ACID team members to promote VSMM07 throughout their own networks and start planning to attend. The VSMM07 conference will include workshops in a diverse range of areas including stereographics, multimedia and artworks, as well as a Digital Salon program of exhibitions and entertainment. More information is available at the VSMM07 website. The Queensland Department of State Development has launched a new Success Stories website, listing the diversionary therapy device originally developed by ACID as an example of a world first in science and technology emanating from the Sunshine State. The story highlights the spinoff from ACID to Diversionary Therapy Technologies Pty Ltd and notes new Queensland Government funding for the company in 2007. Visit www.innovation.qld.gov.au and click on �success stories� at the bottom of the page. ACID Creative Communities projects were lucky to secure exhibition space at AMP�s Innovation and Thought Leadership Festival 2007 in Sydney on 29 June. AMP believes innovation is social, interactive, collaborative and playful, and that it thrives when disciplines collide. To bring about this collision of disciplines, IT@AMP hosted the 2007 Innovation and Thought Leadership Festival. The Festival created a space where all of AMP could come together to �play with a purpose�, so they could create new value for their business and their stakeholders. ACID and Creativity and Cognition Studios put together a joint Festival exhibit demonstrating interactive tools, toys and phenomena that show how ACID research can support collaboration and creativity. Demonstrations included Shigeki Amitani�s Scenario Generation for Supporting Creative Activities, Julien Phalip�s Enhancing Creative Communication in Film Scoring, and Ian Gwilt�s Augmented Reality toolkit for creative activities. ACID�s Creative Communities Program Manager, Assoc Prof Andrew Brown, demonstrated the AV Jam system for collaborative music and video jamming. Andrew said the Festival attracted a large number of AMP staff across different business areas, who engaged enthusiastically with the exhibits and got together to tell stories of �what might be� and ask �what if�. developing two InfoPoint prototypes for the Fremantle Boat Harbour WA. The InfoPoints push location-specific content, such as audio and images, to nearby mobile phones via Bluetooth. 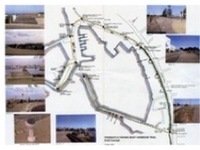 The image shows the complete Boat Harbour walk which is proposed to include 12 networked InfoPoints, and a sample of the audio content (a scathing description of Fremantle by Captain D.B. Shaw in the 1800s) is available here. The InfoPoints will be trialled by the Fremantle City Council, local businesses and passersby during July. For futher information contact Ian MacColl. Calling all ACID Researchers: If you�d like to let others at ACID know when and where you�re publishing, just send the details to Litmus. But don�t forget the publication process requires all ACID publications to be approved � the guidelines are available from Education Program Manager Michael Docherty. ACID Researcher Richard Vella, Adjunct Professor with the School of Communication Design and Visual Arts, Dance, Music & Sound at QUT, is heading south to Newcastle to take up a new role as Chair and Professor of Music of the Newcastle Conservatorium of Music. Richard said he�s looking forward to the new position. �It�s a fantastic opportunity to look at the future role of a conservatorium within the Australian tertiary environment,� he said. Richard will be maintaining his link with ACID, and suggests we all stay tuned for the next developments in ACID Press. He can be reached on Richard.Vella@newcastle.edu.au. Congratulations Richard on your new role! ACID Chair Dr Terry Cutler has been reappointed to the CSIRO Board. In her media release of 2 July 2007, Minister for Education, Science and Training Julie Bishop said Terry has made significant contributions to the CSIRO Board since his appointment in 2002. Terry�s reappointment to the CSIRO Board �will provide continuity and experienced support for [new CSIRO Chair] Dr John Stocker�, the Minister said. After several years of consulting to ACID, Paul Holland is officially joining us in an 80% appointment to build our commercialisation capacity. Paul is currently working with the Research Leaders, the Program Managers, Sam Bucolo and Suzannah Conway to develop a pipeline that will take ACID research from the earliest stages of exploratory investigation within our partner universities, through qualification within ACID projects, to commercial outcomes. He is located in the Kelvin Grove office and can be reached by phone on (07) 3337 7826 or by e-mail at paul@acid.net.au. 4. DATE CLAIMERS: Mark Your Diary Now! Until 18 August, Cyberworlds Gallery, Ground Floor, Powerhouse Museum, Sydney. Demonstration, Artist�s Talk & Live Performance, 11.30�1.30, Saturday 7 July. contact Deborah Turnbull for more information. visit the Institute�s website for more info. 9�10 June 2008, Liverpool UK. visit the conference website for more info. Workshop: 1�2 November 2007, Oslo NORWAY. for more information visit the journal�s website. Spend up to six months undertaking research at the USA�s prestigious Smithsonian Institution. visit the Qld Premiers Department website for more info. 19�21 September 2007, Perth WA. visit the DIMEA website for more info. 20�21 September 2007, Albury NSW. visit the Ripple website for more info. 23�26 September 2007, Brisbane, QLD. visit the VSMM07 website for more info. 24�25 September 2007, Sydney NSW. Wikis at work in the world: open, organic, participatory media for the 21st Century. 21�23 October 2007, Montreal Canada. visit the WikiSym website for more info. 8�9 November 2007, Las Vegas USA. Early registrations before 3 August 2007.
visit the expo website for more info. 26�27 November 2007, Berlin Germany. 6�7 September 2007, Melbourne VIC. visit the IAP2 website for more info. 19�20 September 2007, Melbourne VIC. visit the workshop website for more info. The ACID calendar function is temporarily unavailable. If you have an event, meeting or conference date to share with ACID colleagues, just click here to e-mail the info. Litmus aims to keep you informed about news and events at ACID, the Australasian CRC for Interaction Design. Contributions are always welcome and past editions are available. Just e-mail us with your story idea. To subscribe, just click here. To unsubscribe, just click here.